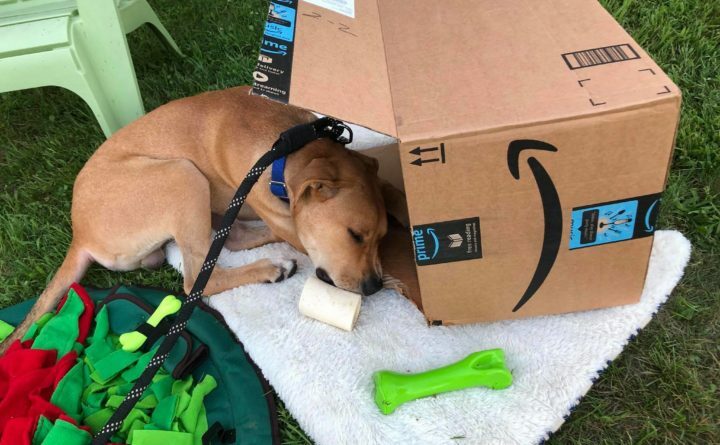 Columbo, the injured puppy rescued by bike in Georgia and adopted in Maine by Andrea Shaw checks out the latest box of donations to arrive at his new home in Gorham. Shaw is working with a local animal shelter to get the donated items into the paws of shelter pets. Never in her wildest dreams did Andrea Shaw think she’d ever be talking about rescue dogs, Belgian athletes and international inline skating competitions in the same sentence. But that was before she helped rescue Columbo, the stray dog she adopted last month. Columbo — or Bo — gained global media attention after he was found by Georgia bicyclist Jarrett Little who carried the obviously injured dog on his bicycle 7 miles back to Columbia where Shaw first met the pup in mid-July. She immediately decided to bring the dog back to her small farm in Gorham and to make sure Bo received the medical attention he needed for a broken hind leg, broken toe and facial lacerations. Bo’s injuries are healing well as the Great Dane mix continues physical therapy, Shaw said. Bo is on bed rest with limited activity for at least another couple of weeks as his hind leg continues to mend, and the four metal pins the veterinarians installed in it set in place. 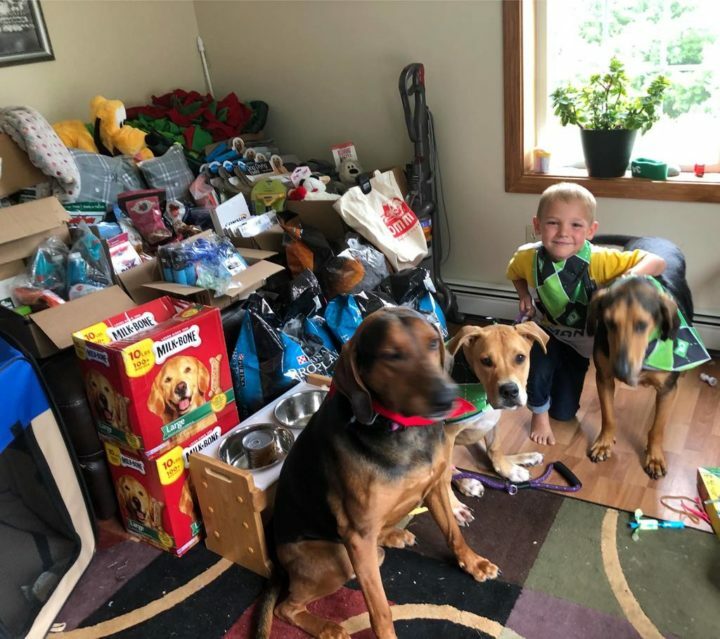 Columbo, the injured puppy rescued by bike in Georgia and adopted in Maine by Andrea Shaw, poses with some of the donations that have poured in since his story went viral. With him are the Shaw's two hounds Pluto and Levi and their son Chris. When he’s not resting or taking part in his physical therapy program, Bo is checking out the hundreds of gifts that have poured in from around the world from some of his fans. Immediately after rescuing the dog, Shaw started a Facebook page “The Adventures of Columbo,” and it now has more than 18,000 followers who track his progress, comment on his photos, and send constant well wishes and more. Junior members of the same team plan on holding their own fundraiser to help out. Now Shaw and Bo are putting all that goodwill to good use. Shaw is working with the Coastal Humane Society in Brunswick to distribute care packages containing the donated items to shelter dogs in Maine and at a partner shelter in Georgia. She’s also working to set up The Columbo Fund, which will help other animals get the veterinary care they need. The shelter has also agreed to accept the donations when the fund is up and running. Coastal Humane was more than happy to step in and help out, according to Jane Siviski, marketing manager at the shelter. That care includes trauma, emergency care, orthopedic surgery and dental care. Shaw is also talking with food pantries in Maine that supply dog food to owners in need about making monetary and food donations. Shaw, a Portland banking attorney, is having a pretty good time with it all, and if there is any downside it’s that none of it is happening as fast as she’d like. Shaw said she is shocked that Bo’s story has gone around the globe and the ensuing response. In Shaw’s case, it was a broken puppy looking for some love.